Antibiotic resistance is a major threat to current medical practice, slowly eroding the life-saving progress we have made since the discovery of penicillin. A new class of bacteria, termed CRE (carbapenem-resistant enterobacteriaceae), have developed particularly powerful enzymes that destroy antibiotics, building on enzymes that have evolved over millennia of warfare between different microbes. In 2011, PSI researchers first revealed the structure of the most dangerous of these enzymes, the metallo-β-lactamase NDM-1 (as described in the Featured System article Superbugs and Antibiotic Resistance). NDM-1 is particularly effective because it is unusually promiscuous: it can destroy penicillin, ampicillin, cephalosporin, and every other β-lactam antibiotic. We normally admire enzymes for their remarkable specificity: they recognize specific molecules and perform a chemically exact reaction. NDM-1, on the other had, has a far more general task to perform: it needs to protect bacteria from an entire class of antibiotic molecules. Structures of NDM-1 with different antibiotics have revealed that it does this by recognizing only the common features between all these drugs. As seen above in the structure of NDM-1 with faropenem, solved by PSI Biology researchers at MCSG and MTBI (PDB entry 4hky), the enzyme has two metal ions (magenta) that bind to oxygen atoms in the distinctive β-lactam group. 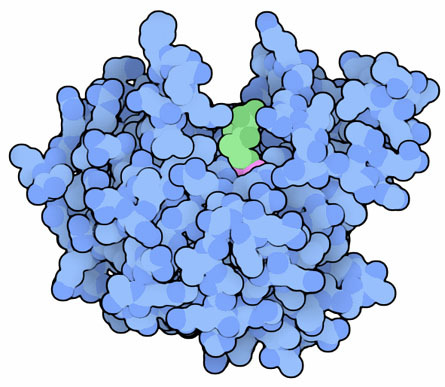 The rest of the active site is largely featureless and can accommodate antibiotics of many shapes and sizes. Of course, we are aggressively fighting back in this ongoing battle, searching for new antibiotics to fight infection by drug-resistant bacteria. The first success was found in L-captopril, a drug that is currently used to treat hypertension. As seen here in PDB entry 4exs, the drug binds to the metal ions in the active site of NDM-1 and blocks its action. Building on this structure, researchers are currently searching for more effective drugs. 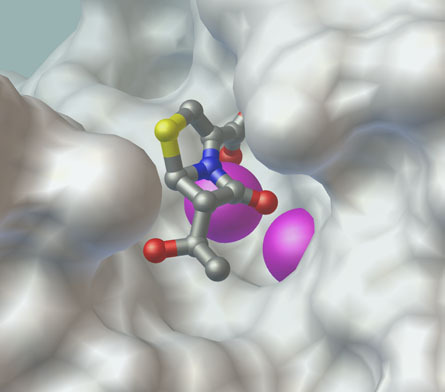 A greater understanding of the mechanism of the enzyme will assist this search for new inhibitors. 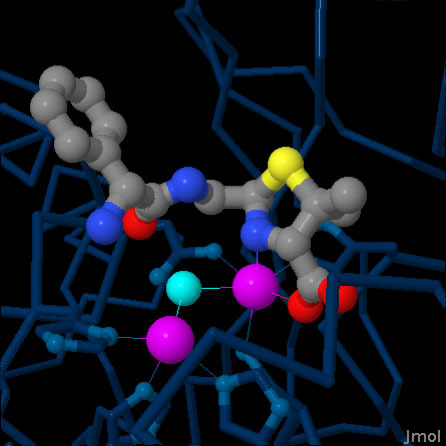 Soon after the first structures of NDM-1 were solved, several laboratories presented structures of the enzyme bound to the product of the reaction: hydrolyzed antibiotics. The earlier steps in the reaction, however, have been difficult to capture. PSI Biology researchers have revealed two of these steps by studying the enzyme with cadmium ions instead of the normal zinc ions. This slows the reaction, allowing the complex to be captured by crystallography. The faropenem structure shown above is one example, showing the binding of substrate, and they have also been able to capture an intermediate state of ampicillin, shown here from PDB entry 4hl1. Computational analysis of these structures underscored the importance of a hydroxide ion, shown here in turquoise, that is positioned by the metal ions. To explore these structures in detail, click on the image for an interactive Jmol. This Jmol includes four structures showing different steps in the reaction. The first structure shows faropenem bound in the active site before reaction. The second structure captures an intermediate state of ampicillin that showed disordered electron density around the central ring. This was interpreted as a mixture of non-hydrolyzed and hydrolyzed forms, so several atoms of the central ring are missing. The third structure shows ampicillin after the reaction, with the β-lactam ring broken. Kim, Y., Cunningham, M. A., Mire, J., Tesar, C., Sacchettini, J. & Joachimiak, A. NDM-1, the ultimate promiscuous enzyme: substrate recognition and catalytic mechanism. FASEB J. 27, Epub ahead of print (2013). King, D. T., Worrall, L. J., Gruninger, R. & Strynadka, N. C. J. New Delhi metallo-β- lactamase: structural insights into β-lactam recognition and inhibition. JACS 134, 11362-11365 (2012).